Hollywood action films are increasingly becoming paint-by-numbers fare with uninteresting characters and unbelievable scenarios. The Raid, Welsh born writer and director Gareth Evans’ third feature film, hits hard due to its no-holds-barred coercion, unfaltering intensity and desire to do what most action films don’t: surprise its audience from the opening moments to the final fade to black. Tasked with taking out Tama (Ray Sahetapy), landlord and kingpin to the scum of Jakarta, a SWAT team enter the building complex in which they believe he and his drug lab to be located. Unaware of the tenants’ loyalty to Tama, they must rise up the block, floor by floor. 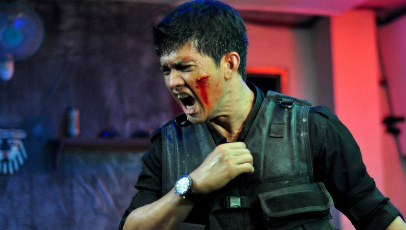 But as the situation heats up, and SWAT members are killed off one-by-one, team member Rama (Iko Uwais) must step-up in a bid to complete their assignment and escape the labyrinth. The pace is furious, the score bass-heavy, and the action sequences violent – though surprisingly low on gore. It’s an action lovers dream, but Evans knows full well when to apply the brakes and allow for a brief moment of respite. These moments, which are interspersed throughout the course of the film’s snappy 100-odd minute running time, not only enable Evans to maintain the taut, unknowing aura that reigns supreme, but also provides the audience, and remaining members of the SWAT team, time to collect their thoughts and try to make some sense of the escalating situation they’ve landed themselves in. When the action sequences arrive, therefore, they’re almost entirely unexpected and achieve maximum impact, as the SWAT members are caught off guard and forced to use any means necessary – whether it be weaponry or their own bare hands – to fend off their enemies and stay alive. Beautifully choreographed, and almost in sync with the beating, bassline-heavy score that permeates the entire film, Evans proves himself more than capable of maintaining the exhilarating stamina that was established in the unyielding opening minutes. Substance isn’t a particular issue here, as Evans allows no real time to inspect what’s not on offer. And, with every minor matter of contention noticeable, there’s a sense that if these aspects were polished, then the jagged edges that make The Raid so distinguishable would be replaced by an annoyingly unrealistic Hollywood sheen that would instantly ruin the rough, verbose texture that Evans commands so effectively. His technical achievement is astonishing for someone so unpracticed. The way he moves the camera to ensure no space is left untouched, the old-school sheen that pays homage to the martial arts fare that’s disappeared, to an extent, and the mix of Eastern and Western influences; it’s all deployed with an eye for perfection that will likely ensure The Raid’s worldwide success and future cult status. The Raid’s inevitability as an action totem is underpinned by an excellent central performance by Uwais, who embodies Rama with enough likeability and humility to excuse his violent tendencies as survival instinct, and also a short, sharp disposition that ensures it never outstays its welcome. Evans is undoubtedly a talent to keep your eye on, and The Raid is a film that needs to be experienced at the earliest of conveniences. Previous Post Is Jo Nesbo’s Headhunters Kiss Kiss Bang Bang: Part 2 In Disguise? Very excited about this, great review! Just what I wanted to hear! Thanks for reading it. I hope you like the film, too!